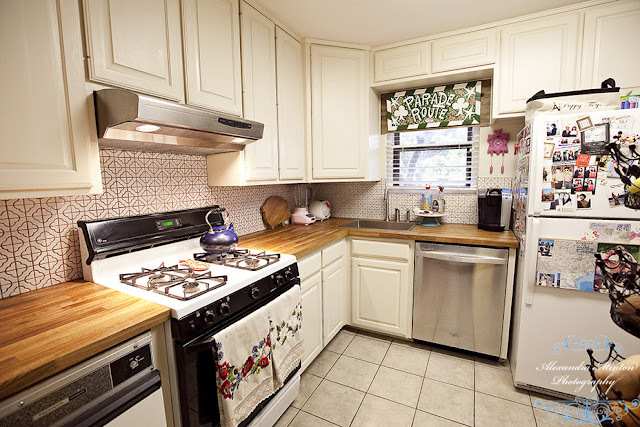 When we looked at our house when we were shopping for our new digs, I was totally ok with the tile floor and cabinets, but the laminate countertops and backsplash killed me. This was the story with the whole house, actually. It was owned by a single guy and he would do all of these home projects that were just not quite right. 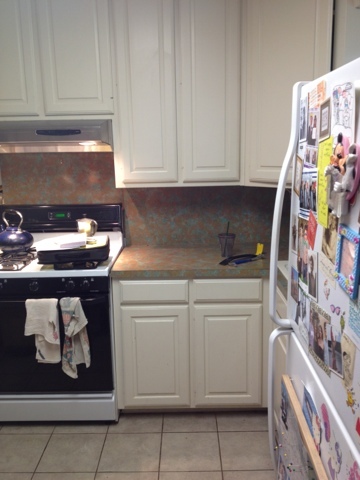 Like paying a pretty penny to redo a kitchen that included swampy colored cheapo laminate. WHYYY, SINGLE DUDE? The good news was we had a great, neutral start to make a kitchen just how I want it. After a few years in laminate countertop purgatory we were ready for the Operation Country Kitchen. I am excited to share more rooms in our house soon and I think you will see how this is a different beat than most of our home. 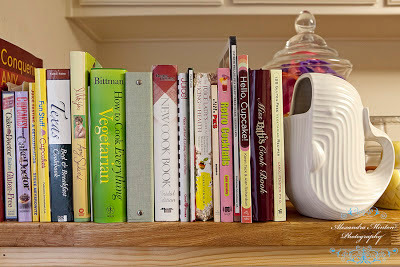 My tastes have definitely evolved from growing up in Western Kentucky and my college years in Lubbock, but my subconscious still believes that the best food comes from a good girl's country kitchen. I want to be inspired to feed people and offer sage advice and make pies in this room. So for this space it was about honoring my roots, the ones that were fed each Sunday from a kitchen with knick knacks falling off of the wall, hanging baskets with dried garlic, a box that said TATERS on it in the corner, and a economy sized squeeze bottle of Parkay in the refrigerator. Here are your official before photos. Notice how the laminate is totally not jiving with the cuckoo clock.Obviously this needed to be remedied. 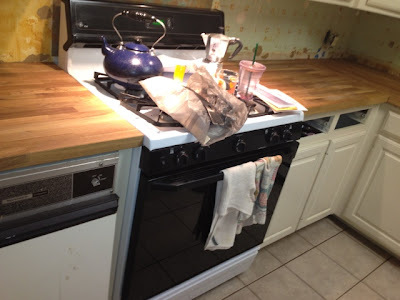 After ripping out the existing countertop and backsplash with a crowbar (super easy and fun), it was time to install the Ikea Numerar countertops. After measuring all of our counter space, we ordered these at the store and the sales associate was really helpful with getting us pieces that would fit with our space with minimal sawing. Except for the big honking piece for the island-style counter above our washer and dryer that easily weighed 150 pounds. By the way, unless you are a She-man married to a He-man, opt for delivery on these as the oak is legit and heavy. Our delivery was $60 and money well spent. How heavy was the oak, you ask? So heavy that there was no way we were going to be able to move the biggest piece outside, make the cuts and bring it back in to install. So we did the rational thing and cut a block of wood with a a worm drive circular saw. In the middle of our living room. After cutting the rest outside, things were starting to look good at the end of day one. Everything already looked so much brighter! Next step was to install the sink (also from Ikea) and the faucet that I bought from Amazon Prime. Let me just say in regards to Amazon Prime, purchasing a faucet online after being able to read reviews on a Wednesday and have it at your house when you get home from work on Friday with ZERO trips to a hardware store is amazing. This post will always be special to me because it marks where Amazon Prime and I fell in love. To cut the hole for the sink and faucet, we traced an outline of the inside of each piece (for us the sink and faucet pieces each had their own hole) and used a jigsaw to cut out the spaces. 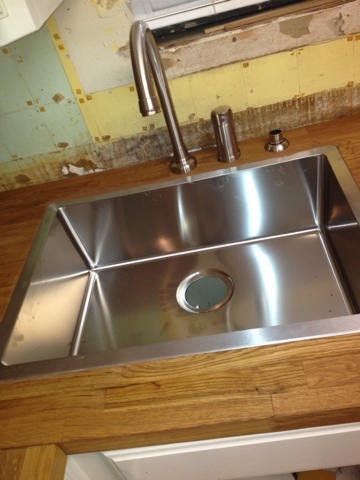 You want the hole to fit the most narrow part of the sink so the perimeter sits on top and blocks the water. 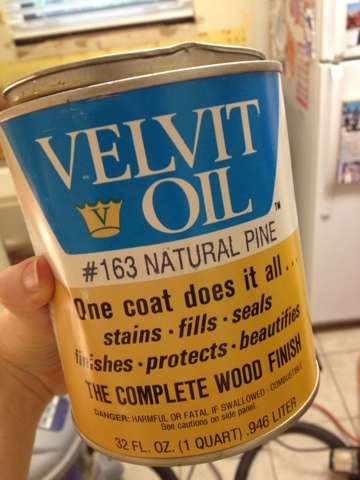 I sealed all the wood with this natural mineral oil, Velvit Oil. I applied it liberally with rags and did about four or five coats total, waiting for each coat to dry about 45 minutes each time until it was dry. I got mine from Green Living in the Dallas Design District. They are a great resource for all kinds of home renovations and projects if you are trying to keep it au natural. After the stain was applied we dropped in the sink and faucet, sealed it with woodtone caulk and attached all the plumbing and the garbage disposal. The next part is awesome because I didn't do it. 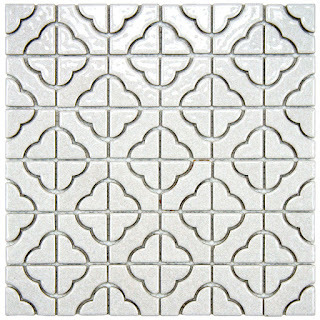 Well, I did order this clover tile from overstock.com. Again with the ordering online and having it delivered to you. Everything on Overstock has free shipping on orders over $50, so all of the tile came to my doorstep for free! After a million trips to the hardware store during the bathroom renovation a month earlier, this was just amazing to me. 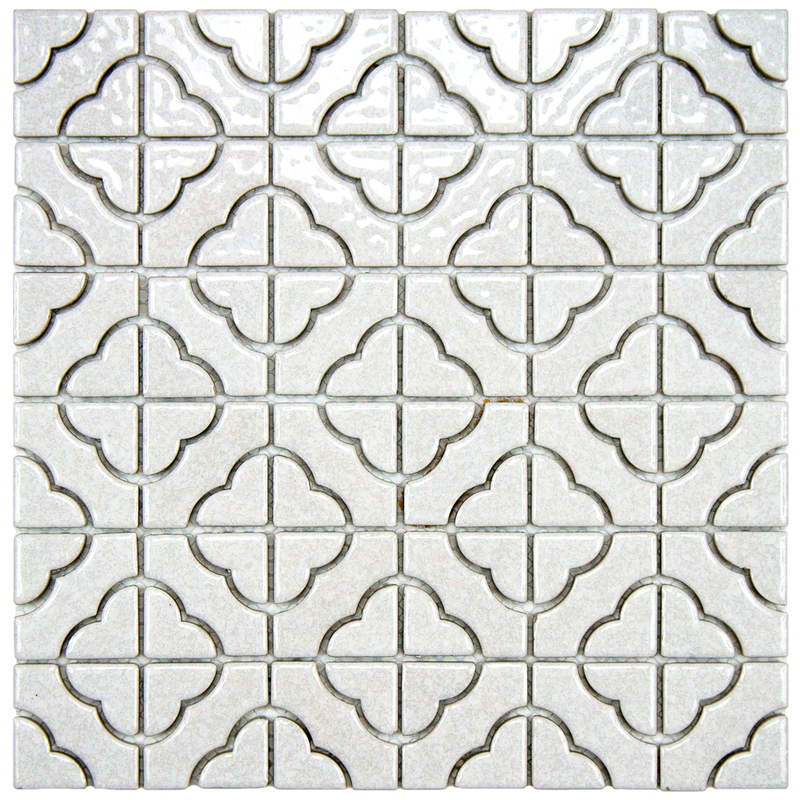 I did a light tan grout to cover stains, bring out the pattern and add a Mexican tile vibe. The tile team was awesome and finished everything in just a few hours! I love how it turned out. Side note: I couldn't find a window valance that wasn't too much going on with the tile, so I decided to hang our New Orleans art by Simon above the window. I go back to the bayou in my head every time I do dishes. A huge thanks to the incredibly talented Ally at Alexandra Minton Photography for taking these after photos. She is totally your girl for family, wedding and project photos in DFW. 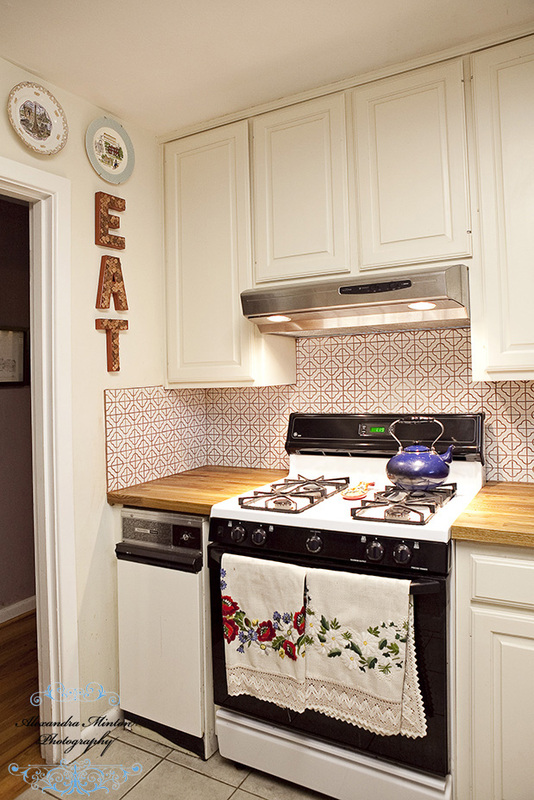 My favorite corner of the kitchen is how the wood and tile looks with my souvenir state plates and copper penny letters. I think I might have been born in a Bennigan's because I secretly love kitsch in kitchens. The wood counter above the washer and dryer adds a special Cracker Barrel touch to my country menagerie. Another found on Pinterest project that has turned out awesome are the garden baskets on the wall to hold fruit thing. I didn't think when I ordered the tile how well it would match the clover design of the tile. They hang right next to what I call my "shelf of spirituality." All my favorite icons in one neat place. 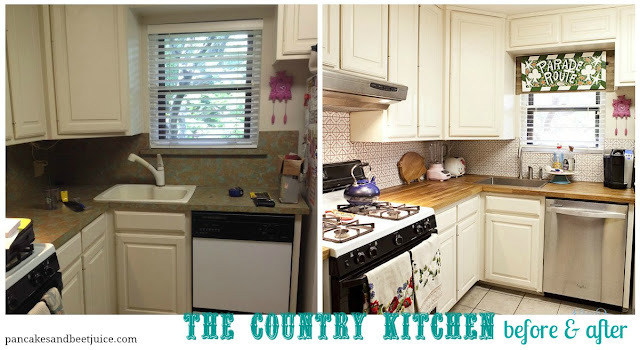 And that is how we took our kitchen from "good bones but a face made for radio" to just right for my secret country kitchen taste. Thank you for stopping by! 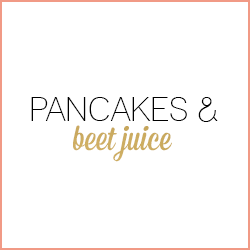 If you have any questions about any of the things we used, way we did things or the like - feel free to email me! 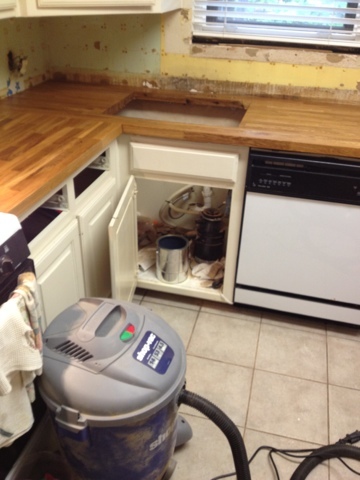 L-O-V-E the wood countertops. Way to go! Must have gas stove and pink cuckoo clock! 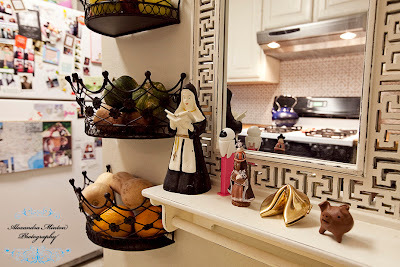 I spy two cute little yellow birdies that must've been given to you by someone with extremely good taste...love the photos - the kitchen looks wonderful, would love to see it sometime! This looks amazing! I think the sign above the sink, and the beautiful counter tops are my fave. Enjoy your new space! Yay!!!! Super cute :) I love the countertops and tile, such great choices!! Lilly!!! 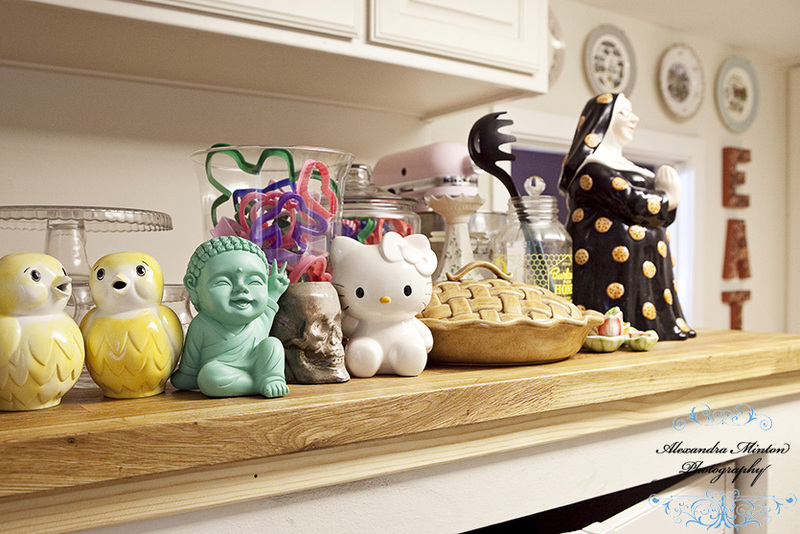 OMG your kitchen looks great! 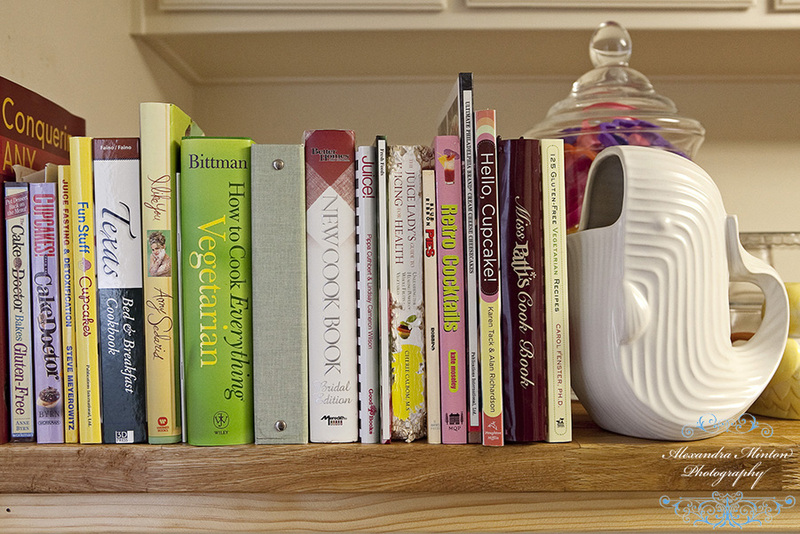 Positively LOVE the butcher block - now I'm thinking of re-doing my kitchen island with it. 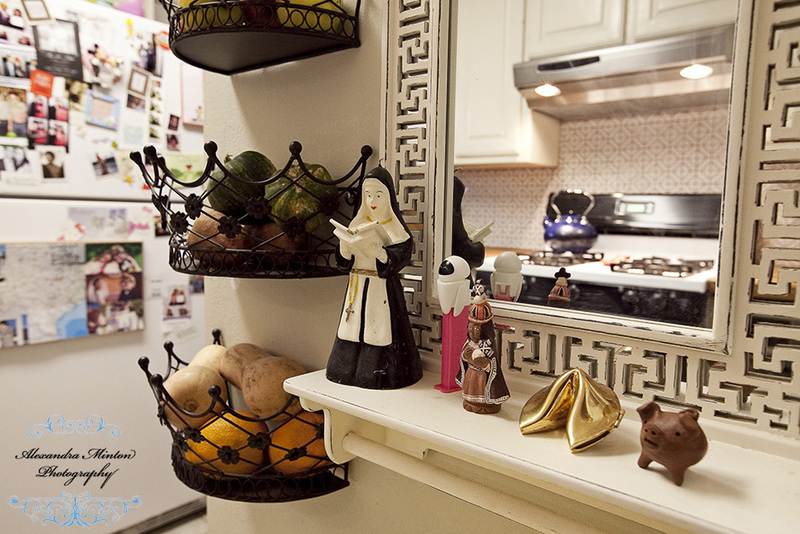 Your house is adorable - especially that little figurine of the singing nun. Is her name Sr. Margaret Anne? Have a great week. AMAZING JOB!!! seriously such an awesome transformation. I love the tiles and the wood countertops. I also need to pick up some of those fruit baskets! Whyy, single dude?! 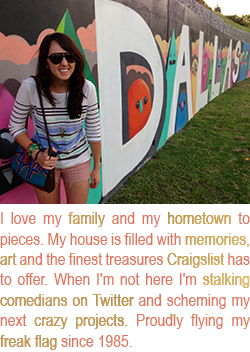 lol What a great post, Lilly! Not only do I love your new kitchen (that tile is amazing!!) but I had a blast reading it! And, isn't IKEA just the most awesome place? Seriously. Wow, it looks so good! 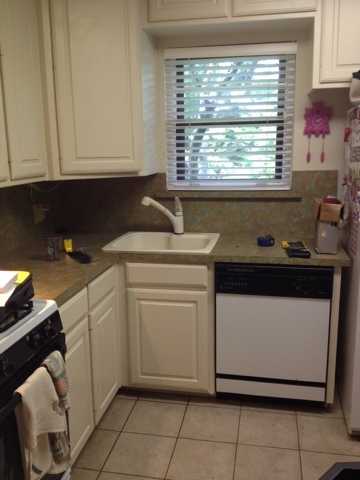 That grout color made all the difference. I so wanted to make those penny letters when I saw them on Pinterest, but I feared them because I'm not crafty at all. 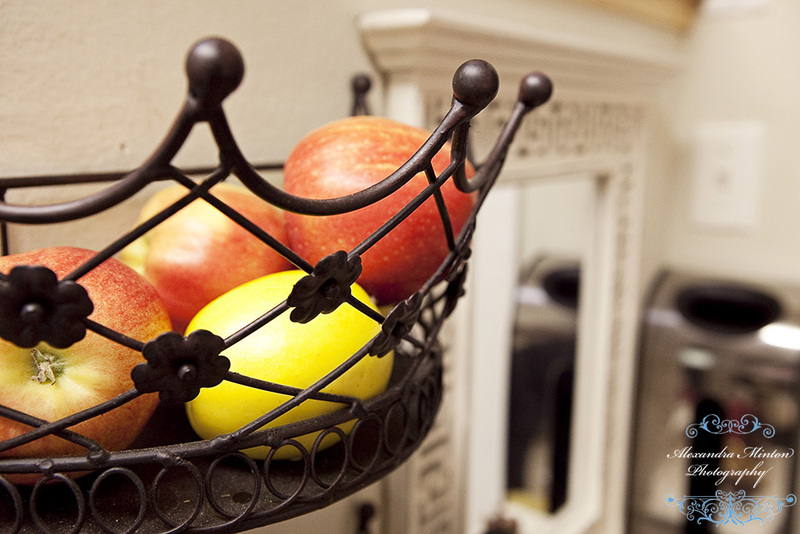 Where is your light fixture from? Hi there! It is from Lowe's (the link is below). This is one thing I wish we had done right when we moved in. We had the cheapo cover for a few years and this one made a huge difference in the light and feel of the room! I came over from Apartment Therapy to ask about the light fixture, too!! Thanks for sharing the source. One more question for you regarding the light fixture... does it flicker when you turn it on (or take a while to fully turn on) like older florescent light fixtures? Did you consider replacing it with a non-florescent fixture? Hi Michelle! When we moved in there was already a flourescent fixture in place (just a really generic/ugly one!) and the ceiling had been painted around it so if we went a different lighting route we would have had to repaint. I thought of other options but they were all lower, and without an island I didn't know if it would look odd hanging in the middle of the room or hit me in the head! I've never noticed a flicker or delay on the light coming on. We got the bulbs from Lowe's as well and there is a pretty wide selection of washes, strengths, etc. I think we chose the one labeled as daylight. Thanks for stopping by! 6 months in, how are you liking the butcherblock countertops? 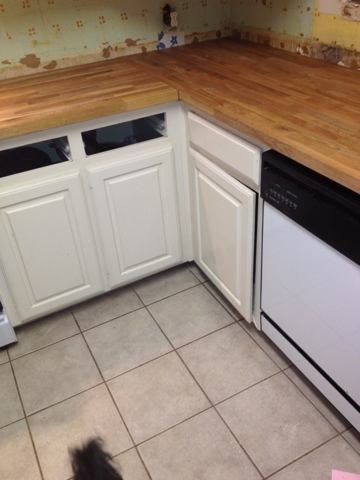 I've been wanting to redo my countertops (cream, the same color as the badly painted cabinets) for aaaages, and the Velvit stuff looks like it could work really well on them. I am really happy we went this direction! The wood feels sealed, but not varnished or super glossy. I avoid cutting on it, but it is nice to know it is more food safe than a traditional varnish. It is so easy to apply that I will probably take everything off the counters and do an overnight coat around the one to one and a half year mark. 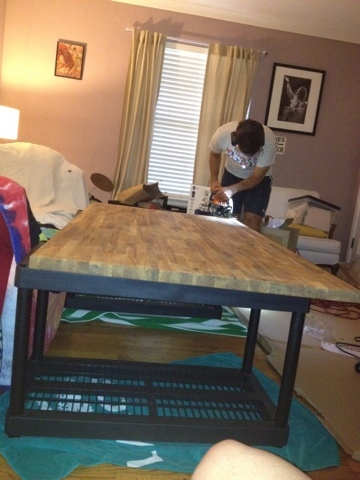 We also used Velvit oil on our hardwoods and they've held up well, so I have high hopes! Thank you for stopping by! Using solid wooden worktops would be a pleasant experience, as they are completely stain-free and easy to clean.